Dear Readers, I am having trouble with my Internet connection tonight so I can't link back to my former reviews and interviews with Barbara. There is also a recent give-a-way that ends Thursday that I posted in my blog. If you want to learn more look back through the blog archives or check the book review link on the side of the page. And, if you haven't read the book you may want to read it. 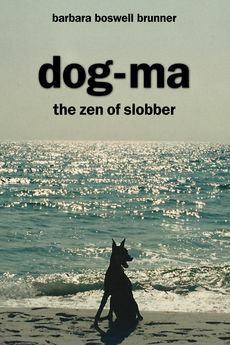 Last March I had the opportunity to interview Barbara Boswell Brunner, author of Dog-Ma: the Zen of Slobber. I had reviewed her book on this site and she was kind enough to do a Q & A about writing and her dogs including Izzy pictured below. 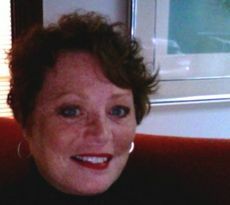 Barbara spoke with me again recently to update readers and followers of this blog on how the process has been in promoting her book and how she is doing. Below is also an excerpt from the book. Dog lovers will surely enjoy. Throughout 2012 and 2013, Dog-Ma has been on the Bestseller lists of Kindle, Amazon and Goodreads aswell as being named as a finalist in the 2013 Next Generation Indie Book Awards in the animal/pet category and presented with a medal at the Harvard Club in New York City - May 2013. It is everywhere. The stark white walls shimmer with droplets like a Jackson Pollock painting. My hand pulses with pain as I struggle to separate the combatants, one collar in each outstretched hand. Rivulets of red run down my arm and I am unsure if it belongs to me. I cannot, I must not fixate on it. My heart pounds until I am sure it will escape my chest; each beat pronounced and strong. My predicament is clear: let go of one and the other will perish. I must hang on and wait for calm to prevail. Breathe deeply. Show control. No, TAKE control. I try convincing myself this will all be over soon. I cannot scream; it would only exacerbate their fury. Time slows as though the clocks have momentarily stopped. With each breath, the pain of my hand surges through my body. Morgan shakes her head and dots of red splatter onto the floor. The soft white fur surrounding Izzy’s mouth is stained with a cocktail of gore. Her blue-clouded eyes sparkle as she gazes blankly in an undetermined direction. She cannot see her intended adversary, having been robbed of vision a year earlier. Her snarls are guided by her nose; her anger guided by fear. As my muscles strain to maintain the distance between the combatants, I hope for a reprieve. I struggle to control one hundred and twenty pounds in one hand and twenty pounds in the other, tenacity compensating for the smaller stature. Deep claret tones slowly ooze through her long white, wiry fur. I can already see her eye beginning to swell shut, like a prize-fighter on a losing day. Morgan is dripping blood. Izzy’s tooth has ripped a gash in the tender velvety lining of her ear. She shakes her head to ease the pain. If I wasn’t so damned pissed off I could appreciate the artistry of the spatter, with flow and movement as intricate as any piece of MOMA artwork. “Leave it!” booms from around the corner. Ray extricates Izzy from my hand, gently coaxing her to settle down. Izzy’s maniacal temper has not eased, evidenced by her continued struggle for freedom. Izzy has only one mission: kill or be killed. It does not matter that the Rottweiler is six times larger or has jaws that could crush bone. She must prevail. Failure is not an option. She is a terrier. Ray has a soothing effect. Izzy feels safe in her human dad’s arms. They have much in common: determination, stubbornness and moxie: two peas in a pod. Where they differ is in temper. Izzy has no control over hers. When the anger switch flips in her tiny little brain, no one can turn it off. She is focused to a fault, her tantrums often triggered by the fear of her sightless world. Morgan sighs. She is ready to be released. She quiets easily and quickly. She is a gentle giant, not a fighter. She bites only to defend herself. If her intent were to eliminate her assailant, it would happen in one quick snap of her jaw. She cannot understand why this monster was brought into our peaceful home. We were a happy family until Izzy appeared. She is the Anti-Christ. She is pure evil. Our home has become a salient battleground with opponents always vigilant, wary of the other, waiting for the first sign of war. Finally, the opponents are separated, sent to their respective corners. Equanimity has settled in, not like a comforting blanket, but a static-filled one; on edge and ready to snap at the first sign of friction. I wonder how our family became ensnared in this violence. It wasn’t always this way. There was a time when our home was a sanctuary of Zen-like calm, a respite from our hectic professional world. We rescued abused and abandoned animals, provided them with comforting shelter and loving care. Yet, here I sit on the kitchen floor, assessing the multitude of damage, wondering where we failed. Barbara is available for book readings, autographing and speaking engagements and may be scheduled for your book or dog event. Welcome to Pugs & Pics Barbara. Thank you for being willing to talk to us again. 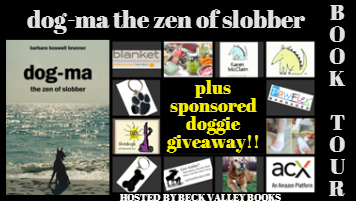 Q: It's been awhile since your book Dog-Ma: The Zen of Slobber came out, how would you say response has been? Do you have any anecdote you can share regarding your favorite comments or responses? A: The response to the book has been wonderful and beyond my wildest dreams. My original intent was for my dad to be able to remember all of our dogs as he retreated into Alzheimer's. He lived long enough to see it published and seeing the joy in his face while holding his copy will be a memory I always treasure. After he passed, my husband and I had the daunting responsibility of cleaning out his apartment and one of the items we accidentally donated to a thrift store was dad's copy of Dog-Ma, on which I had placed a very personal cover page note for him. Several weeks later I received an email from a woman who had purchased that book, started reading it and realized what she had in her hands. Though my father lived in PA and I in FL, this book had been found by a woman visiting family in PA, who also lived in Fl, very near to me! Serendipitous. We met, found we both have a passion for dogs and rescue and have become fast friends. Q: What is the most important thing you learned about writing and marketing a book from this experience? A: Writing a book is the easy part, though it may not seem so at the time. Marketing is challenging and demands constant attention. It is very difficult for a self-published author to get their books out into readers hands. Social media has given us a platform and if used wisely can aid in the process. Selecting the proper channels and knowing when and how to promote is tricky. Having experienced people along the way to assist is necessary. Using experienced bloggers and book tour managers is essential and the experience is magical when it works. Q: When I first interviewed you gave some advice about writing a memoir -- "Define the message and then tell your story." First, how would you categorize the message of your book and second how did you go about defining thins? I find this is often a challenge for my students as well as myself --what is it I am trying to convey with this story? A: The message within Dog-Ma can be viewed on the surface that by seeing the humor in the nutty and comical things our animals do on a daily basis life becomes more fun. If you look deeper, I think the message is that no matter what these crazy animals do they must be loved and accepted and never become "throwaway animals." Adopting an animal is a lifetime commitment, not a short term "while they are cute" commitment. It breaks my heart to see senior dogs or those with challenging personalities in the shelters. If there is one message I could shout from the mountain tops it would be that. I am not sure I even thought about that message as I was writing the book. I believe it is just a part of my soul and being. So as advice to your students I would have to say that you have to have belief in what you are writing, you must become a participant in your story, feel your characters and your message will become clear. Q: Now that sometime has passed is there anything you wished you had done differently with the book -- any story you wish you had included or left out, for example? A: Simply, yes. Every time I reread it there are things I want to change -- things I wish I had said differently. Some of the things I wrote about offended people. They were not meant to, the stories I told were true. These things really happened to me and to my dogs. It makes me sad that some people felt hurt by my words. It was certainly not my intent. Things that I found humorous, others did not, but I suppose that is what makes the world more interesting. Q: As someone who has lived with so many dogs what is the one piece of advice you would give to someone considering getting their first dog? A: I recommend visiting the shelter you are going to adopt from with every family member. Visit with the dog you are adopting and make sure there is a connection. Don't adopt a dog just because it is cute or because it looks like one your Aunt Sue had. Really get to know each dog that is available. Personality is so much more important than looks. Isn't that so true in dating, as well? This animal is going to be a family member. Make sure it is a good fit so it will last for life. Don't overlook senior dogs or dogs who are specially-abled. They have just as much to offer as puppies and often come housebroken and trained. As always remember Adopt, don't Shop! Q: I asked before and have to ask again, how is Izzy doing today? A: Izzy is doing extremely well. For those who do not follow her on Facebook (and yes, she has more followers than me) here is a quick recap. In May, she had a very small window of opportunity to have one of her eyes operated on, in hopes of giving her some vision back. The cataract had started to become hyper-mature and if we did nothing we would have no chance of regaining vision. We had just a week to make not only the decision to have the surgery but to organize the plans to travel two hours away to have it done. The post-op care was daunting and I had to make a spreadsheet to keep track of her drops and medicines. There was something we had to do to her or give her every walking hour of the day for many weeks. However, the operation was a smashing success and she now has full vision in her right eye. She is back to her old self, playing ball, chasing geckos, and running no-stop. She just had a checkup with her eye surgeon at the end of October and were told the surgery results could not have been any better. Sadly, we lost Morgan in September to bilateral renal cancer. As much as Izzy fought with Morgan, she still mourns her. We often find her in Morgan's bed. She sniffs the cover and sighs. Sometimes she will roll around in it, but she will never sleep there. I am sure she misses her. Q: And finally, what are you working on now? Have you begun a new book? A: I have started two new books and cannot seem to get very far into them. Losing Morgan took us by surprise and I believe once I have been able to fully process what happened it will become the next book. Canine cancer has taken four of my dogs. I want to write about it as a cathartic exercise and be able to donate the profit to canine cancer research.